Is Your Pet Suffering from Depression? Do You Know? People aren't the only ones that get depressed. Pets can suffer from depression too. Depression in pets can be caused by a variety of factors such as grief over the death of a human member of the household or another pet. It can also be the result of a move or other break from regular routine. If you work long hours and your pet is left alone for long periods of time, he can become depressed. 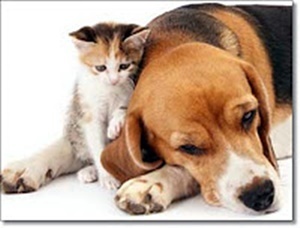 There are usually several signs that may indicate your pet is suffering from depression. Many times a pet will get depressed if someone new comes around and they feel replaced, whether it's another pet or a person. So be sure to include your pet in activities with the new person or pet in your life. Don't leave them out. You can also help your pet get use to the new person or pet by allowing them time to get to know each other without you around. Be sure to continue your regular activities with your pet that you engaged in before the new person or pet arrived. Take walks and play at the same time and for the same length of time. If there will be a new baby in the house, get your pet use to the sounds and smells of a new baby as best you can. Eating and drinking less often - A depressed pet will begin eating less and sometimes stop eating entirely. Chewing and destroying things - When pets are depressed, they take up destructive behavior as a cry for help. Going to the bathroom inside the house or outside of the litter box. This doesn’t just indicate bad behavior in mad or angry pets - bathroom “accidents” may not be accidents at all - your pet may be too sad to get up. Loss of interest in Activities - Lethargy and lack of interest are telltale signs of depression in humans and animals alike. Dog is wagging its tail less - Happy dogs wag their tails. Hiding - When your pet starts making a home out of the dark corners and spaces in your house (closets, under your bed), and takes up residence in an area they don’t usually frequent, this could be a sign that they’re depressed. Not wanting to be left alone - Like their human counterparts, when feeling particularly sad, some pets do not want to be left alone. Separation anxiety is signaled by excessive crying and whining when you attempt to leave the house. This is often accompanied by #2, chewing or destroying things. Too little or too much grooming - Cats have a tendency to under-groom when they are depressed, but once in a while, you’ll get a pet that does quite the opposite. Watch out for skin irritation and shedding. Increased vocalization - If your pet is crying, whining, or barking more than usual it’s possible there is something wrong and they are trying to communicate with you the only way they know how.